So you’ve seen all the Super Bowl Ads. The gals cried over the Clydesdale reunion, the men wanted more of Kate Upton, everyone sang with Jimmy Cliff, and in living rooms across America Paul Harvey’s voice once again made time stand still. There was one Super Bowl ad that didn’t cost a penny and didn’t air on CBS, yet scored a strategic touchdown on social media. Two more ads that skipped the Super Bowl were equally as creative and targeted, but they too stood on the sidelines as their brands chose different offerings—one a pared down version. The most brilliant message was posted on Twitter 20 minutes into the third quarter blackout inside the Super Dome. The creative team at Oreo cookies, which had earlier aired an ad about people fighting over the virtues of light and dark, fired up their computer and went to the dark side. 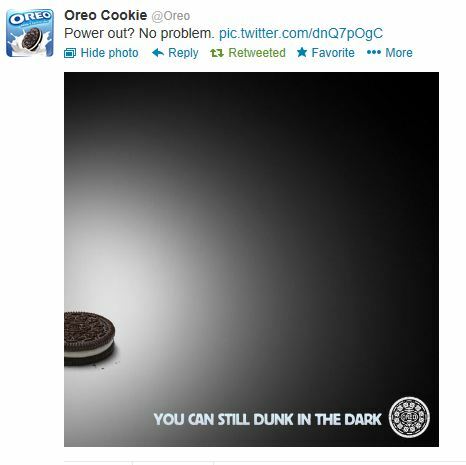 They created a simple picture and copy: “You can still dunk in the dark.” Targeted at social media savvy consumers trolling for entertainment during the black out, Oreo’s brand loyalists found the message and the picture turned viral in minutes. Another exceptionally targeted ad that never aired during the Super Bowl has just hit the airwaves in Europe. Volkswagen’s agency DDB played off of well established psychological research showing viewers of advertising most remember dogs and babies. In Das Hund, DDB gives us the comical story of a dog who thinks he’s a car and falls in love with the new VW. The target audience is not just dog lovers, but drivers who covet style and performance. 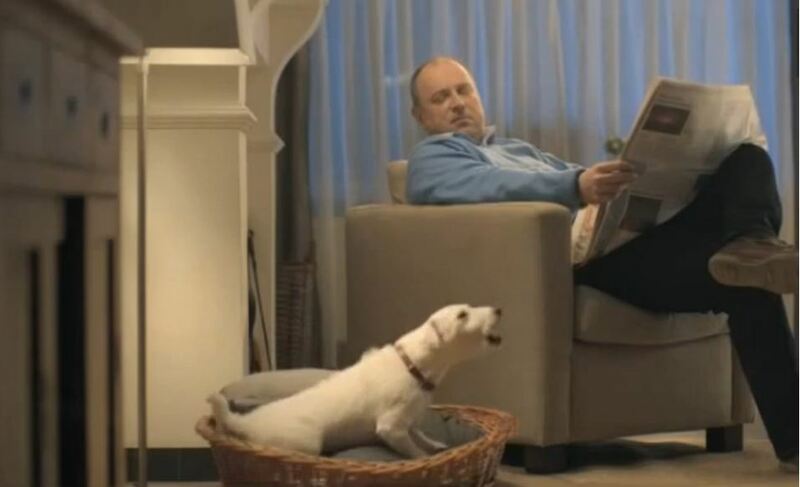 USA Today’s Ad Meter shows Super Bowl viewers liked VW’s Jamaican Get in-Get Happy, but with so much pregame exposure one can’t help but wonder if Das Hund wouldn’t have been a better choice. And then there’s Coca-Cola. I have to admit, I’m a big fan of Coke’s messaging strategy and its new brand extension of encouraging people to conduct random acts of happiness. I’ve written in a previous post about Coca-Cola experimenting with this strategy in South America. In the Super Bowl’s first quarter, Coke gave us a new U.S. 30-second version of the same concept complete with a soundtrack from Roger Hodgson formerly of Supertramp. However, the 1:30 version is actually stronger and dare I say—more satisfying. I’m only one voice, but I would have loved to have seen this version in the Super Bowl instead, perhaps even tied to a social media campaign about sharing one’s own acts of kindness. I agree with you, Timothy. I really like the Coca-Cola Security Cameras ad, too. What a perfect match with Roger Hodgson’s “Give a Little Bit.” Roger’s timeless, universal lyrics go hand-in-hand with the footage of acts of kindness from around the world. It makes us think if only we would all just give a little bit, what a better place this world would be. I saw Roger in concert last year and his show was amazing. I can’t wait to see him again next month in Florida. I thought you’d enjoy this video from Roger’s YouTube channel where he is performing his classic, “Give a Little Bit” – http://www.youtube.com/watch?v=9uf7YXII_Y8. Loved the video, Lucy! Thanks for sharing. I was in middle school when that song hit the charts. I think just about everyone in school had a copy of the album. What great memories those old Roger Hodgson songs bring back. As soon as those first three strums of the guitar rang out in the Coke commercial, I knew something magical was about the happen–so glad the creative team did not disappoint. I couldn’t agree with you more, Ana. Coke’s brand has has always been about happines in a bottle, and this new extension of spreading the happiness through random acts of kindness is a logical fit. The fact that they co-mingle the message with one of the anthems of the baby boom genertion certainly gives it more power. I could re-watch this one all day! Thanks so much, Rissa. Like yourself, when I heard the first guitar chord I knew this was going to be something special. It was! I think Coke is onto something here; it will be interesting to see how far they take this new branding campaign.